Glass or cellophane noodles are also known as bean thread noodles because they are made from mung bean starch or sometimes green pea starch, and are used in Asian soups, hot pots, stir-fried dishes, or spring rolls. Mung beans are closely related to peas and lentils. They are fat-free, gluten-free, and are chewy delicious. Glass or cellophane noodles look like thin rice noodles. They appear white and opaque in the package and often come in bundles. If you are not sure whether they are rice or glass noodles, just check the ingredients. The ingredients should be bean starch or pea starch with no wheat or eggs. Another variety is wide, flat cellophane noodle sheets called mung bean sheets, which are also produced in China. A thicker variety popular in Korea is made with sweet potato starch. This variety of glass noodles is called sweet potato noodles or dangmyeon. When glass noodles are soaked in water and cooked, they turn from white and opaque to transparent. This glasslike, or translucent cellophane appearance is because of the bean starch that is used to make the noodles. Glass noodles taste similar to wheat noodles but are softer and slightly heavier in texture. The noodles are usually served at the bottom of the platter or serving bowl in restaurants with the other ingredients served on top like an Asian-style casserole. The noodles easily absorb liquid, so you can be liberal with sauce when stir-frying. Glass noodles can be boiled like regular noodles but not as long. Boil them until they turn transparent and are soft enough to eat, which should be about 3 to 6 minutes depending on how much you cook at once. Drain well and rinse through with plenty of cold water to rinse out the excess starch. Toss the noodles with a 1/2 teaspoon of oil to keep the noodles from sticking together. You may want to cut the noodles before stir-frying, as the noodles can be very long and hard to toss in the pan otherwise. While glass noodles seem lighter than other types of pasta, they have about the same amount of carbs as regular spaghetti and more than whole-wheat spaghetti. You get 36 percent of your daily carbs from one serving of glass noodles. They are considered a complex carbohydrate, which is a better source of fuel for your body than simple carbs like sugar. Glass noodles are sugar and fat-free, and a low-blood sugar carbohydrate, which means it is a safer carb to eat if you are diabetic or must watch your blood sugar levels. There is a trace amount of protein and a small amount of iron, niacin, and selenium in one serving of glass noodles. You can buy the noodles in any Asian specialty store. 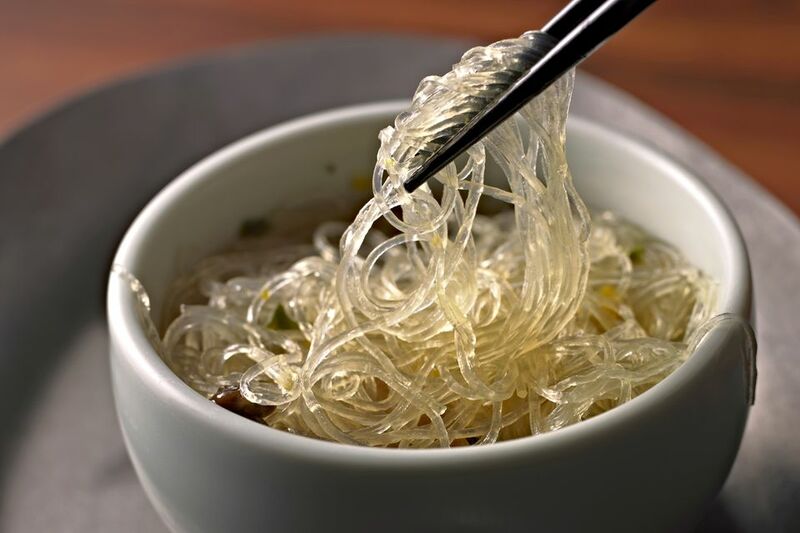 Glass noodles are a popular cuisine component in China, India, Japan, Indonesia, Korea, Thailand, the Philippines, Vietnam, and Malaysia, among other cultures. If you do not have an Asian market near you, you can find the noodles easily online.